With 500 W (RMS) power, depths to 1,900 ft and a 5" color display, echo 500c ushers in the next generation of fishfinders. When bragging rights are on the line, this is the technology to turn to. 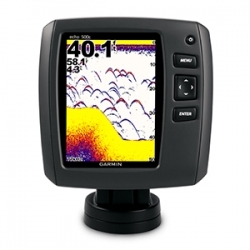 echo 500c scans the waters with 500 W (RMS) power and extra-sensitive Garmin HD-ID™ target tracking technology. Then it displays what it sees on a 5" (12.7 cm) QVGA display. A dual-beam transducer optimizes performance for deep or shallow water, offering wide-angle (up to 120 degree) coverage to target fish beyond the sides of your boat and the ability to scan bottom profiles down to 1,900 ft (579.12 m). For an uninterrupted view of the sonar image, echo 500c boasts Garmin Smooth Scaling™ technology, which means you won’t lose sight of the sonar history as the unit changes depth ranges. It also features the ability to rewind your sonar history in order to ensure that you haven't missed a thing.